Dusky Shark is a big Ocean predator which can be found in tropical and subtropical oceans around the world. Their wide range extends to the Atlantic, Pacific and Indian oceans. They are also known as bronze or black whalers. The skin of these sharks is covered with diamond-shaped denticles with five horizontal ridges on the surface. They live a long life and survive up to fifty years in the wild but they are very slow to grow and reproduce. They belong to order Carcharhiniformes, family Carcharhinidae and genus Carcharhinus. They belong to the group of requiem sharks. Requiem sharks are those that are most likely to be involved in attacks on humans. On an average, the total length of dusky shark can reach 12 to 14 feet and weight from 350 to 765 pounds. In the upper jaw, they have triangular-shaped teeth and in the lower jaw their teeth are narrower, more pointed and finely serrated. Female Dusky sharks give birth once every three years. They may have a gestation period of up to 22 months. A dark stripe often appears on these sharks which extends from the pelvic fins to its head. They are known for seasonal, temperature-driven migrations. Male and female individuals undertake in separate groups. These large-bodied sharks are an important fisheries resource. They are used for human consumption, leather and liver oil. Declan, Tobin. " 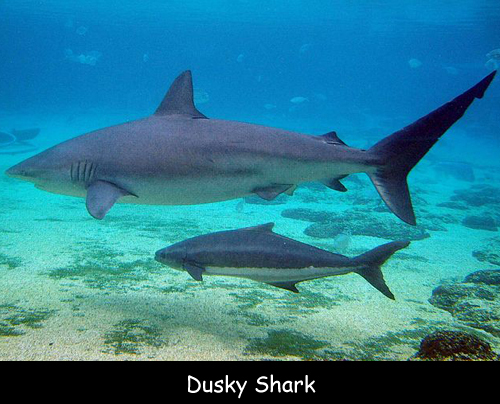 Dusky Shark Facts for Kids ." Easy Science for Kids, Apr 2019. Web. 21 Apr 2019. < https://easyscienceforkids.com/dusky-shark/ >.